Toronto After Dark’s Closing Gala, YOU MIGHT BE THE KILLER is one of the smartest and funniest horror films you will see this year! In the middle of the night, a remote summer camp counselor Sam (CABIN IN THE WOODS’ Fran Kranz) calls up Chuck (BUFFY’s Alyson Hannigan), his best friend back home, in a blind panic! Sam’s surrounded by brutally killed fellow counselors and worried there’s an axe-wielding psycho on the loose! Luckily Chuck’s well-versed in slasher movie tropes and she leads Sam through all the necessary steps to survive the night. At the same time they try to identify the actual killer. With great banter between two delightful leads, a brutal killer in the woods, and lots of clever bloody twists, YOU MIGHT BE THE KILLER is a horror fan’s delight! A horror thriller told from the perspective of two young outcasts, Justin P. Lange’s award-winning, and Tribeca Film Festival feature debut, THE DARK, evokes wonderful comparisons to previous Toronto After Dark favourite LET THE RIGHT ONE IN. In the forest where she hunts for fresh flesh, Mina, a strange zombie-like girl, encounters Alex, a lost blind boy. But instead of devouring him, she takes pity on Alex and lets him live. Both have been victims of abuse, and each finds connection in the other. But with some malicious adults on the hunt for the boy, the new friendship and Mina’s instincts for survival are soon put to a bloody and ferocious test. Stunningly shot, beautifully acted, THE DARK is a thrilling and atmospheric horror film not to be missed. With his latest feature, Chad Archibald (THE HERETICS) delivers a terrific, supernatural crime-thriller with a touching father-daughter story at its heart. At his remote country farm, William has a very unique job: disposing of dead bodies for the local crime lord. Meanwhile his young daughter Gloria is convinced she can see the spirits of the dead, haunting their house. When he discovers a young woman still-alive in his latest delivery of bodies, William decides to save her. But that puts him in the cross-hairs of his boss. It’s not long before a gang of heavily-armed killers are on their way to the farm to finish the woman off, and anyone in their way, living or dead! A big hit at Fantasia and Frightfest, Justin McConnell’s latest LIFECHANGER is a unique blend of body horror and serial killer thriller. Drew is a myserious “skin-walker”, a shapeshifter who periodically has to murder and steal the body of a new victim, in order to stay alive. Emotional attachment is something he does not crave, until at a local bar, he encounters Julia (POOR AGNES’s Lora Burke), with whom he seems to have a special connection with. As Drew tries to get closer to Julia, his physical condition deteriorates and he finds his secret slowly being exposed. Featuring fantastic performances, gruesome body-swapping effects, and a unique point-of-view that will have you sympathizing with both killer and victim, LIFECHANGER is a refreshing cinematic treat! Legendary Canadian icon, Art Hindle (BLACK CHRISTMAS, PORKY’S, THE BROOD), delivers a career best performance in, ROBBERY, Corey Stanton’s outstanding debut crime thriller. After a local crime lord threatens a young thief (Jeremy Ferdman) with clearing his debts, he enlists the fine criminal skills of his crotchety aging father (Hindle) in a series of reckless heists that should recoup him all the money he needs. But complicating matters, are heavily armed criminals in their way, and juggling the day-to-day challenges of his father’s dementia diagnosis. Full of twists and turns, ROBBERY is a brilliantly scripted, character-driven delight, with a fantastic cast that also includes CORNER GAS favourite, Tara Spencer- Nairn. For Toronto After Dark’s annual Zombie Night, fans can look forward to shotgun-blasting treat with this rare, big screen presentation of, I AM A HERO. It was a huge hit at SXSW where it won the Midnight Audience Choice Award. Based on the critically acclaimed manga, Suzuki Hideo is a shy, struggling comic book artist. But when Japan gets hit by the ravaging ZQN virus, it’s time for this zero to become a hero in an epic battle against the undead! Fans of the Toronto After Dark hit, TRAIN TO BUSAN, will be be delighted with this apocalyptic crowd-pleaser, packed with original, gory and thrilling zombie action! CHECK BACK BY SUN, SEPT 30 FOR COMPLETE FESTIVAL SCHEDULE & SINGLE SCREENING TICKETS! By the very end of September, the festival schedule and single tickets for sale will be available here at the festival website. The complete Toronto After Dark 2018 lineup will include 20 screenings, including 18 Feature Films and 2 Short Film Showcases. In total, over 50 films - shorts and features - from around the world will screen at the event. Fans can expect as with previous years, the vast majority of screenings to start at the convenient prime times of 7pm and 9.30pm over the festival’s nine nights, Oct 11-19, at the Scotiabank Theatre, 259 Richmond Street, Toronto. (UPDATED): The Complete Festival Schedule and Order Screening Tickets Now Available Here! ALREADY ON ADVANCE SALE AND OVER 80% SOLD: FESTIVAL ALL-ACCESS PASSES! 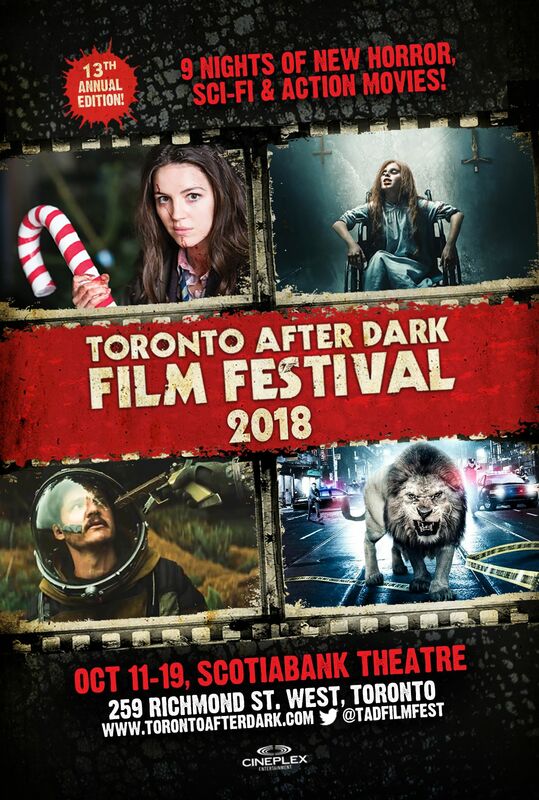 Fans interested in seeing a bunch of films at Toronto After Dark 2018 are encouraged to snap up one of the festival’s best-selling ALL-ACCESS Passes, already on advance sale, before they’re all gone! They give priority entry via the Passholders line to all 20 screenings over the festival’s nine nights, Oct 11-19, as well as save over 40% - over $110 in regular ticket purchases! The passes, retailing at $159, equivalent to just $7.95 a screening, make great gifts to treat friends and family and sell out early every year, and are already over 80% sold out. Find out more about Toronto After Dark’s All-Access Pass, and snap up yours now at the link. Now in its 13th Year, Toronto After Dark Film Festival is one of the world’s leading showcases of new Horror, Sci-Fi and Action cinema. Each October, in the run-up to Halloween, the critically acclaimed event, screens over 50 new feature films and shorts from around the world over nine thrilling nights in front of over 10,000 attendees, including over 150 members of Press and Industry in Canada’s largest city. SHARE THIS PAGE WITH A FRIEND: Tell a friend about our Films Announcement by sending them an email link to this page by clicking here. PLANNING TO ATTEND? Join the Official Facebook Event Page and get Festival Updates by subscribing to our E-Newsletter, Facebook, Twitter and Instagram Feeds. VOLUNTEER: Join our volunteer contact list. PRESS & MEDIA Representatives: Please Sign up for Press Updates & Accreditation. FILMMAKERS: To submit to our next fest, get notified of our Next Call for Entries which will begin in the New Year, by joining our Filmmaker Contact List Here. SEE YOU AFTER DARK THIS OCTOBER 11-19!